We, who are descendants of James Birnie of Spokane House and Fort Vancouver, have known he went out in the 1826 York Factory Express to Hudson Bay. What we did not know, however, was that a journal existed that chronicled the journey of this historic express. It was the first of many York Factory Expresses, and unique to all of them. We also presumed that James Birnie might have been the leader of this express — he was not. In fact, James Birnie was at Spokane House in 1826, and he joined the express from that place. The man who took out the express from Fort Vancouver was Chief Trader John McLeod, Senior. He had been posted at Kamloops for four years and was now crossing the mountains, at Governor George Simpson’s request, to work on the east side. He would spend the next few years building the new Norway House at Jack River. John McLeod’s original journal is in Library and Archives Canada, but a transcript was placed in the B.C. Archives about a century ago. His original journal was written in a notebook, and is not written in any order and so must be cobbled together. It was also written in pencil, for reasons that will become clear in the transcript below. By the way, the original was placed in the “Dominion Archives” in 1897 by John McLeod’s son, Malcolm McLeod, Q.C. Malcolm McLeod is also the author or editor of Peace River: A Canoe Voyage from Hudson’s Bay to Pacific by the late Sir George Simpson, in 1828: Journal of the late Chief Factor, Archibald McDonald, who accompanied him. This is where I discovered that John McLeod’s 1826 journal actually existed! So here we go. This journal is not the way it appears in John McLeod’s little red notebook, the transcript of which is found at BCA, A/B/40/M22.2A. Remember, I said that I have cobbled it together, and I have corrected some of Malcolm McLeod’s errors (for example, he thought “Owhyhees” may have been Orkneymen, when they were actually Sandwich Islanders). “Left Kamloops 19th Feb arrived at Okanagan 28th of the same month. Left Okanagan 2nd March and arrived at Walla Walla on 7th of the same month. Left Walla Walla on 8th March and arrived at Vancouver on 13th. “Remained here [Fort Vancouver] about 7 days and started on the 20th [March] with the Express for the east side the mountains. March 1826 Monday 20th. Started from Ft. Vancouver at 4 P.M. with 2 Boats accompanied by Messrs [James] Douglas & [Francis] Ermatinger passengers 3 Calves & 3 Pigs. Raining very heavy. Encamped early & gave the men time to take their [regale] at the upper end of the [Plain] before the fort. Tuesday 21st. We were delayed this morning by two of the Owhyhees having gone back to fort last night and where [?] I saluted by some friends of a good strong [illegible] but proceeded and breakfasted at the upper end of Johnston Island. Proceeded and encamped at a little stream opposite [line illegible]. Rained all day and cold. I am much afraid that the calves will not be got up safe. Wednesday 22nd Started at half past 5 put the calves ashore at the foot of the Cascades. Breakfasted in the middle of the Portage. Very disagreeable weather since left Ft. Vancouver. Thursday 23. Raining all Day proceeded about 4 P.M. [A.M.?] Put the Calves ashore at the Lower end of Thompsons Portage gave them in charge to the little Chief and Mr. McKay’s guide & one Owhyhee. Proceeded with the Boats and encamped at the little Riviere [of] Dalls [Dalles]. Great many Indians assembled and Rem’d all night. Kept watch all night. Friday 24th proceeded up the Dalls to the  the men took the Papers [?]. All the Indians as usual followed us with the Constant Cry of Cynol [?] or Tobacco. Got above the Big dalls by 1 P.M. & arrived at the little Dalls and passed them by 2 and at 3 arrived at the Chutes where met with a greater Concourse of Indians than I ever saw here they volunteered to Carry the Boats which I permitted as I did not wish to encamp here for fear they might injure the Cattle. After we got everything to the upper end of the portage the Indians began to be rather troublesome and pushing forward towards the Baggage and in putting back from it one of them put an arrow in his Bow and as he was taking an aim at me Mr. Douglas (as he was paying attention all the time) uncovered his gun and backed it. Two of the Owhyhees took the muskets immediately when Mr. Ermatinger and myself joined and advanced with our gun[s] cocked toward the Crowd and pushed them back. A Cayous [Cayouse Indian] joined us and spoke to the rascals for their bad Conduct. Got the Boats loaded & Mr. D and myself ran along the shore to protect the Calves till were got a Board which being soon accomplished and proceeded a little piece further and encamped for the night. Saturday 25th Raining Weather continuing. Proceeded at 8 o’clock having lost some time in gumming the Boats went on all Day and encamped at 10- Miles above John Days River where  a large Band of Indians visited us. Gave them a smoke and the most part of them went off. I forgot to mention on the 24th the Indians who murdered the Woman at Ft. Vancouver were the Chuts [Chutes] in fact the Cayous informed me at the Dalls the Indians at the Chuts were ill inclined towards us. Sunday 26th The weather fair which is the first fair day since we left Vancouver proceeded with a fair wind after breakfast and continued all right, when we encamped below the [Big?] Island. One of the Calves from being confined in the Boat all day was lame. Monday 27th Proceeded at 1/2 past 5 weather fine steady breeze all Day and encamped above the Grand [Umatilla] Rapid. I have now being going up & Down the Columbia for four years and never saw so many Indian on its Banks as now. Tuesday 28th Cloudy weather. I got up several times in the course of last night and changed the situation of the Calves. Proceeded and arrived at Walla Walla about 3 O’clock P.M. began immediately to arrange affairs with Mr. [Sam] Black. Wednesday 29th Remained here all day. The Boats employed all the men for all this Day to arrange them…. Thursday 30th Started from W.W. at 7 A.M.  Breakfast at opposite L & C [Lewis & Clark, or Snake] River… Encamped upon the 2nd Island from the foot of the Marle Banks [Hanford Reach]. Let the Calves lose [loose] all night. Saturday 1st [April] Proceeded. Rained very heavy till about 11 A.M. breakfast about 10 miles below the Priest’s Rapid. Cleared up about 11. Continued our Route and got up with great difficulty above the lower Portage where we after Dark encamped. Brought the calves & pass[engers] by land. This part of the Rapid is very bad. Sunday 2nd Proceeded and got to the upper end of the Rapid about noon where we patched our Boat and Breakfasted. Continued with a head wind and encamped 10 Miles above the Rapids. Great many Indians followed us [4 illegible words] the Bishop. Monday 3rd Cloudy and showery. Not got far this morning before we broke a plank in our Boat close to the Keill [keel] consequently was obliged to unload and repair which lost us 2 hours as we had to put on 3 feet of a plank. Breakfasted about 12 o’clock & continued  and encamped on the N side of the River in the bend below Pacquin [Rapid]. The strong head winds we had since we left Walla Walla impedes our progress very much. Tuesday 4th. Blowing hard from the N. Proceeded 4 A.M. and breakfasted about noon above the Stoney Islands. Proceeded blowing very hard and encamped at 1/2 past 7 P.M. opposite the Piscouhoose [Wenatchie] River. Wednesday 5th Started 1/2 past 4 A.M. Clear weather milder than it has been since we left W.W. Breakfasted above the G[illegible] Point. Snow is only begun to melt in this quarter consequently Rises the main River much higher than it was about this time last year. Continued our Route and encamped above the Great Eddy below the Whirlpool Rapids [probably Entiat Rapids]. Thursday 6th Fine weather proceeded 3/4 past 4 last night having put up very late the Calves were immediately landed as usual and their being very hungry they went out without stopping in quest of a spot to feed. I went after them and seeing them safe near the camp I did not tye them…. I never saw so much snow at this season of the year at this place as there is now for it is still in some places on the Hills down to the water side and the main River very high for the Season. Arrived at Okanagan some time after dark. Friday 7th The men employed Today at repairing the Boats Mr. Ermatinger and Mr. [Archibald] McDonald at the quill. [Ermatinger remained at Okanogan]. Saturday 8th Sent off the Boat this morning and arrived at the Forks River with Mr. McDonald. Sunday 9th Let OK [Okanogan] early this morning with W..se [horses?] and arrived above the Stone [Gross Rochers or Hellgate, I believe] about 3 minutes before the last Boat about 5 P.M…. Monday 10th Proceeded and encamped below the Ling [San] Poil River. Tuesday 11th Proceeded and got to the [Spokane] forks about Sun Sett. Set to work immediately about the accounts….. Memorandum: To Enquire of Jacques Finlay [at Spokane House] if it’s practicable to Cross the Rocky Mountains in July [?] to write Mr. McLoughlin his opinion on that head. 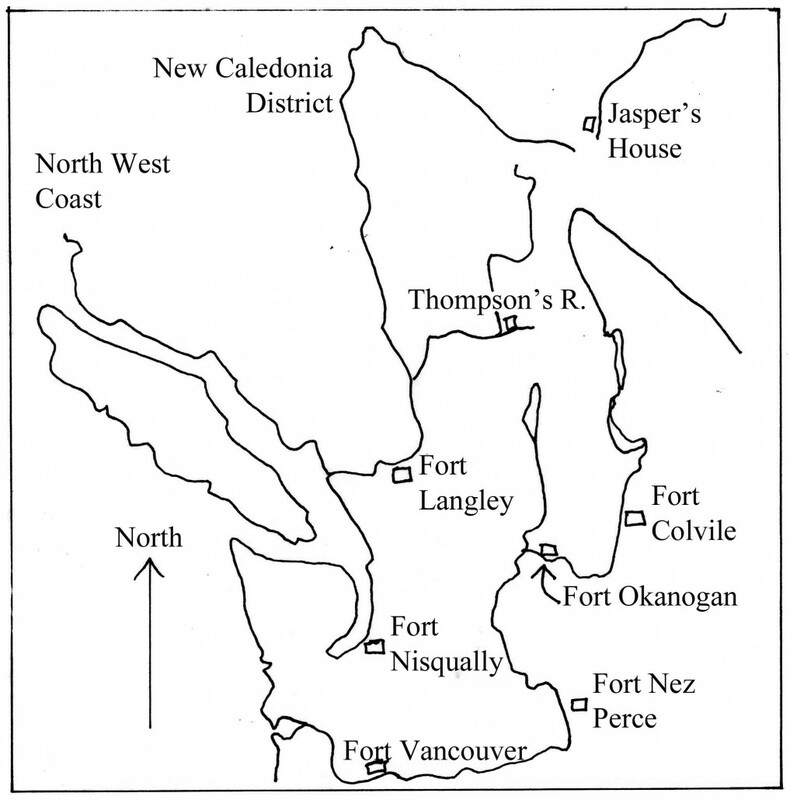 “Arrived at the Fork of Spokan 11th April and left it on the 17th and arrived at the Rocky Mountain [Boat Encampment] on the 17th inst [April]… [Fort Colvile did not yet exist].” James Birnie accompanied the express north up the Columbia River to Boat Encampment. Sunday 16th The accounts were closed about Sun sett. Sent the Boat with [every]thing except the Paper trunk [blank] and encamped about 1 mile above the [Spokane?] fork. Got the Paper trunks Packed and followed & Slept with the Boat. Monday 17 Left the Forks this morning and proceeded before Daylight and encamped about 6 Leagues below the Grand [Rickey] Rapid. Tuesday 18th Started one hour before Daylight. Breakfasted below the Grand Rapid. Proceeded. Arrived at the Grand Rapid about 11 A.M. Carried Cargoe & the Boat with much difficulty being only eight men. Got to the Kettle fall about 1 P.M. Got all Cross but we had to wait some time to Collect the Indians to help in Carrying the Boats so that the sun was sett before we got the Boat Packed and Loaded. Started from the Portage and Encamped a little above…. [The Calves must have gone to Spokane House, intended for Fort Colvile]. Wednesday 19th Proceeded at 1/2 past 4 A.M… and encamped about 10 miles below the Pend-d’Oreille River. Thursday 20th Started 1/2 Past 4 A.M. and Breakfasted 6 miles above P.O. River. Cloudy weather. Passed McGillivray [Kootenay] River about 7 P.M. and encamped at the entrance of the [Lower Arrow] lake. Friday 21st Started 1/2 an hour before Daylight. Raining all the morning Breakfasted about 1/3 the Lake. Cold Raining weather continued on till night and encamped about 5 Leagues from the upper end of the first Lake. Rained all this day. Saturday 22nd Started before Daylight & Breakfasted upon an Island in the narrows between the two Lakes. Continued on through the Upper Lake and encamped within 4 or 5 Leagues of the Upper end of the Lake. We did not see an Indian all Day. Sunday 23rd Started as usual before Daylight but we did not go far before we found the Lake Covered with Ice from side to side. Broke our way through with axe and poles and breakfasted at the Upper end of the Lakes where found about 6 Indians from whom we traded a few [snowshoes] called Bear’s Paws. The snow is laying thick yet along the River down to the water edge. Came a long Piece up the River and encamped 12 miles below the Dalls. Monday 24th Rained last night but clear weather this morning. Started at Daybreak. Met two  Indians below the Dalls from whom we traded 1 Pair snow shoes and a little Bear Meat. Breakfasted below the Dalls. Continued the snow & ice is pounding over the water edge along the River which makes it Difficult for the men to haul upon the line. Encamped half way between both the Dalls [Steamboat Rapid, and Dalles des Morts, presumably]. [There is a day missing here, I wonder if I overlooked it]. Wednesday 26th Weather very cold 6 feet of snow along the water edge. Breakfasted below the crooked Rapid. The men we have with us who used [to] pass here in spring says they never saw so much snow as there is this year. The ice is yet as it was in winter in some places. The River we passed piles today at the water edge 10 feet high. Encamped 1/2 Days march below the Portage. “Arrived at the Rocky Mountain on the 27th inst & the boat in security and started on the 28th but the Snow is so deep that we were obliged to Cut our leather Trowsers to make snow shoes of. We arrived on the East side the mountains the 5 May. 10 to 12 feet [snow] at the Columbia (Great Bend) [Boat Encampment] & 30 feet under foot at the summit of the [Athabasca] Pass (6,025 feet above sea) on 2nd May… Came to Edmonton on the 17th. As you can see, this was no easy journey across the mountains to Jasper’s House. I understand that when the men arrived at that post, they found the little house buried to its eaves in snow. You would wonder why the HBC men from Fort Vancouver would try this trail again, at this time of year. But, remember, it had already been used for many years by the North West Company. In addition to that, everyone who knew the country said that the snow was much deeper than was normal. They had no reason to expect that the weather would be the same in any year that followed, and as far as I know, there was never a spring that had so much snow as that one had. It is a lot of fun to see what James Birnie experienced in his 1826 journey over the Rocky Mountains. It seems that everyone spend their time cold and wet from the constant rain that fell that year. There is, by the way, one more comment that I should add, written by Malcolm McLeod and found in A/B/40/M22K, BCA. This, as the book shows is almost wholly in pencil. The special cause of that was that the journey was in the dead of winter and three fourths of it in deep snow without facility for entering in ink. The difficulties and hardships of the whole route — fully two thousand miles — during a winter of unexampled severity in heavy snowfall and corresponding increased spring flood encountered (upstream) about one thousand miles — all successfully encountered without loss of life or property, or scathe in any way, marked this feat as one remarkable in the story of travel. Under the most favorable circumstances, as to season and equipment, the route was ever extremely dangerous to life especially in the “Dalles” — rapids — chutes or cataracts, of the Columbia with their treacherous maelstrom eddies, defying utmost skill and car and energy in navigation. To be added to that was a chronic hostility of the untameable natives when at all (as oft) in force. The little pocket memo, on the harrying way, speaks not of such incidents save to note barely those of the moment.. Very interesting, as usual. I have a question related to form rather than substance: In your mind, or voice as you give talks, how do you pronounce Ermatinger? Is it er-ma-TING-er, rhymes with finger? Or is it er-MAT-ing-er? Or maybe er-MAT-in-jer? Next, does McKay rhyme with sky, or does it rhyme with day? Ha! I knew you would be the first to comment on this. Ermatinger — there used to be a cop show on TV which featured a Texas policeman named Ermatinger, and they pronounced his name without accent on any syllable, just Ermatinger. Which is just the way he pronounced, and so did I. 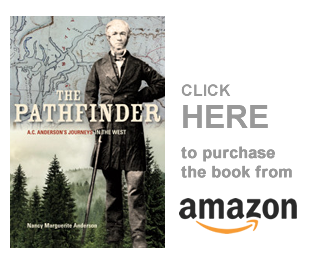 However, when Aemilius Simpson entered the territory he met Francis Ermatinger at Okanogan, and wrote his name as “Armatinger.” Which says more about Francis’s accent than the way the name is said today. McKay: I would say as sounded, and presume that if it was McKie it would be spelled differently. So, for me, it rhymes with Day. But who knows. We who mispronounce names and words do it because we READ them, not learned them from someone else. You should hear how I used to pronounce Pend’d-Oreille, the river, until I heard Jack Nisbet say it on a video I viewed. I would have embarrassed myself totally, if I had said it the way I thought it was said. Oh, by the way, I do have to doublecheck how I say all French words. Just because I am a Canadian doesn’t mean I know how to pronounce all these French words that are part of the fur trade West of the Rockies. Jack Nisbet named his dog for my ancestor, Beaulieu, and was afraid to say his name to me as he presumed I spoke French. Well, he could have said it anyway he wanted and I would not have known the difference…. In fact, I collected from all my Canadian relatives the ways they said Beaulieu, and it was the same way I said it.So, in the end, who cares.